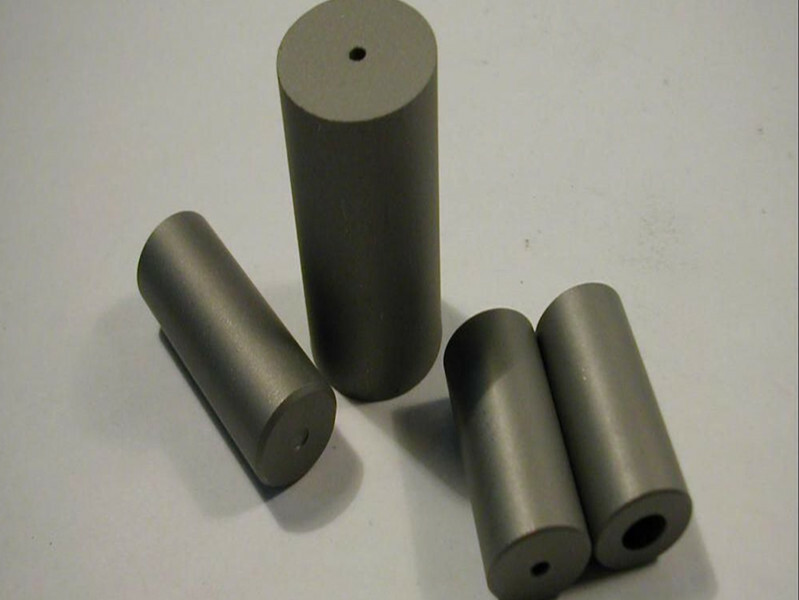 Tungsten Heavy Alloys (WHAs) are tungsten alloys that typically contain 90 to 98 wt% W. Most commercial tungsten alloys are two-phase structures, the principal phase being nearly pure tungsten in association with a binder phase containing the transition metals plus dissolved tungsten. As a consequence, WHAs derives their fundamental properties from those of the principal tungsten phase, which provides for both high density and high elastic stiffness. It is these two properties that give rise to must applications for this family of materials. The majority of current uses for WHAs are best satisfied with the W-Ni-Fe system. such as 93W-4.9Ni-2.lFe and 95W-4Ni-lFe represent common compositions. The addition of cobalt to a W-Ni-Fe is a common approach for slight enhancement of both strength and ductility. The presence of cobalt provides solid-solution strengthening of the binder and slightly enhanced tungsten-matrix interfacial strength. Cobalt additions of 5 to 15% of the nominal binder weight fraction arc most common. Balancing weights for ailerons in commercial aircraft, helicopter rotors, and for guided missiles. High performance lead-free shot for waterfowl hunting. Many applications that require high gravimetric density for balance weights, inertial masses, or kinetic energy penetrators or high radiographic density for radiation shielding and collimation necessitate rather large bulk shapes. Such a requirement eliminates all but a few candidates on the basis of prohibitive cost, typically reducing the choice of very dense alloys down to either tungsten- or uranium-base materials. Tungsten heavy alloy is a suitable raw material for radiation protection, as its combination of radiographic density (more than 60% denser than lead), machinability, good corrosion resistance, high radiation absorption (superior to lead), simplified life cycle and high strength. WHA can provide the same degree of protection as lead whilst significantly reducing the overall volume and thickness of shields and containers. Besides, compared with lead or depleted uranium in the past, it is more acceptable in this case, for they are non-toxic. WHA typically consists of 90 to 98 wt% W in combination with some mix of nickel, iron, copper, and/or cobalt. The bulk of alloy production falls into the 90 to 95% W range. The choice of composition is driven by several considerations. The primary factor is the density required by the given application. Further considerations include corrosion resistance, magnetic character, mechanical properties, and post sinter heat treatment options. The first tungsten heavy alloy developed was a W-Ni-Cu alloy. Alloys of this ternary system are still occasionally used today, primarily for applications in which ferromagnetic character and electrical properties must be minimized. W-Ni-Cu alloys otherwise offer inferior corrosion resistance and lower mechanical properties than the present industry standard W-Ni-Fe alloys. The majority of current uses are best satisfied with the W-Ni-Fe system. Alloys such as 93W-4.9Ni-2.lFe and 95W-4Ni-lFe represent common compositions. The addition of cobalt to a W-Ni-Fe alloy is a common approach for slight enhancement of both strength and ductility. The presence of cobalt within the alloy provides solid-solution strengthening of the binder and slightly enhanced tungsten-matrix interfacial strength. Cobalt additions of 5 to 15% of the nominal binder weight fraction arc most common. For extremely demanding applications, even higher mechanical properties are obtainable from the W-Ni-Co system with nickel-to-cobalt ratios ranging from 2 to 9. Such tungsten heavy alloys require resolution/quench, however, due to extensive intermetallic (Co3W and others) formation on cool down from sintering. A number of special tungsten alloys are known as well. An example is the W-Mo-Ni-Fe quaternary alloy, which utilizes molybdenum to restrict tungsten dissolution and spheroid growth, resulting in higher strengths (but reduced ductility) in the as-sintered slate. There are also a number of systems in various stages of development for kinetic energy penetrators that are intended to provide a tungsten heavy alloy that will undergo high deformation rate failure by shear localization in a manner similar to quenched and aged U-0.75Ti for more efficient armor defeat. These alloys to date have not exhibited a property set of interest for industrial applications, however. Main Component: W (88-98)% with the addition of nickel and copper or nickel and iron, etc. Main Application: For making rotors of dynamic inertial materials, the stabilizers of aircraft wings, shielding materials for radioactive materials, containers in hospitals and for radioactive isotope (Cobalt 60), and for material of armor piercing bullets and moulds, etc. -Excellent mechanical properties such as high vibration-damping capacity and high Young's modulus. **We supply this material as per customerized sizes and properties. --Screws/heads for golf club, flying fish sinker. --Counterweight used in yacht, sailboat, submarine and other vessels. --Radiation shield for nuclear U-power, X-ray, medical instruments parts etc. --Professional inspection and technical data available for tungsten and tungsten heavy alloy. All product are custom made and designed to a customer's specifications. Please contact us to discuss your specific requirements.